When we were young, watching the parade on TV was a highlight of Republic Day, especially since there were fewer distractions then! But very few of today’s kids are familiar with the grand show that is put up on this special day. 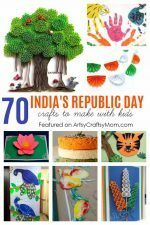 A great way to pique their interest is by trying out some Republic Day special activities, many of which you’ll find here. Today, we’re featuring a special craft for Republic Day, based on the impressive air show that has become a mainstay of 26th January celebrations. This is a super easy craft that even preschoolers can make! Cut out a square of blue chart, just enough for your collage. If it’s too flimsy, reinforce by sticking some cardboard behind it. Cut out nine plane shapes from the black foam or chart paper. Make sure they’re all identical – the Republic Day Air Show is not an adhoc performance! You can either print them out, or make a cardboard cutout and use it as a stencil. Draw a rough outline on the blue chart to have an idea about how you’re going to place the planes. From the bottom of each plane, draw out trails of smoke – this is for the colored glitter. Stick double sided tape on the backs of the planes and keep them aside. Smear glue all over the smoke trails – be generous or else there’ll be blank spaces. The best way to use glitter is to put it in a salt shaker with holes that aren’t too tiny. This way you’ll get some control when sprinkling them. Sprinkle the orange glitter on the first three trails, silver on the next three and green on the last three. Shake off the excess glitter. Nearly done! Stick the planes in position. Draw a few clouds here and there in the sky. Smear glue and stick on cotton wool. Do the same at the end of all the glitter trails to represent that last puff of smoke as the planes whizz through the sky. 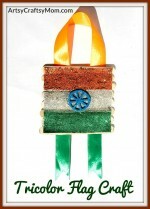 There you go, your very own India Republic Day Air Show Collage Craft – with shiny tricolor! Remember to spread lots of newspaper before you start with the glitter – it can be really messy! 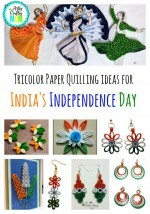 You can cut the mess and do a more basic collage with bits of paper in green, white and orange. 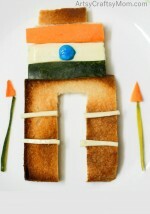 Don’t be surprised if kids want to see the real Air Show after doing this craft!! 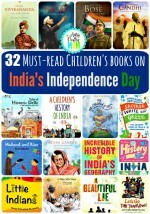 32 Amazing Children’s Books about India’s Independence to Read Right Now. Fabida is a Freelance Writer and Work From Home Mom to her boisterous 8 year old. In between all the writing, baking, nagging, reading and cuddling, she manages to blog a bit about her crazy life at Shocks and Shoes. She writes posts for our Art & Craft Section. She also handles all our Social Media accounts. Yes! 🙂 Will def add it going forward. I’m glad you liked our post. Fabida sure is fabulous.